The Spendor D7 delivers music with a fresh vibrant realism that conventional loudspeakers cannot match. This new level of performance is the direct result of important Spendor innovations. The Spendor LPZ tweeter is built around a stainless steel front plate that forms an acoustic chamber directly in front of the lightweight diaphragm. The phase correcting microfoil equalises sound wave path lengths whilst generating a symmettrical pressure environment so the tweeter operates in a balanced linear mode. The D7 mid-bass drive unit has an advanced EP77 polymer cone, whilst the low frequency drive unit uses a bonded Kevlar composite. The latest fifth generation Spendor Linear Flow port features a twin-venturi, tapered baffle element working in harmony with Spendor's proven dynamic damping, asymmetric bracing and rigid plinth mountings. The net result is that the D7 is a very easy loudspeaker to place in the room, often working happily very close to the room boundaries. It also has the rare ability to combine transparency, decent extended taut bass and a smooth detailed treble. "The D7 is one of the finest loudspeakers I have had in my listening room. ...The D7 is a splendid Spendor. One might seriously question the need to spend any more than $6,495 for a pair of speakers." — Stereophile. "We can't help but marvel at the sound. 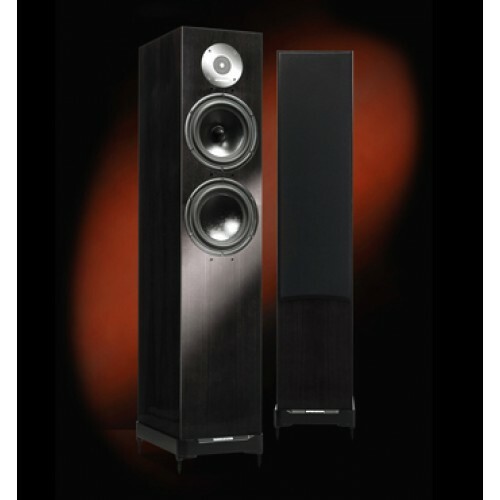 Spendor D7s set the standard for speakers at this price." — What HiFi?